Shopper experience gift package concept. intu operate 14 shopping centres across the UK, including ten of the UK’s top 25, and the UK's first multichannel transactional shopping centre, intu.co.uk. With 400 million customer visits and over 35 million unique customer visits a year, their scale and specialism gives intu a unique insight into today’s consumer and what they're looking for from their shopping experience. Retail change is accelerating. The path to purchase is becoming more complex and customers are blurring the boundaries between shopping, eating and entertainment. Consumer activity and retailer investment is focusing increasingly on top centres which offer a compelling mix of global and national retail brands trading out of flagship stores, enhanced with a wide choice of places to eat, drink and be sociable. As part of this change and to reach new heights in customer experience, intu constantly look for new ways to give their customers more engaging ways to enjoy their shopping experience. 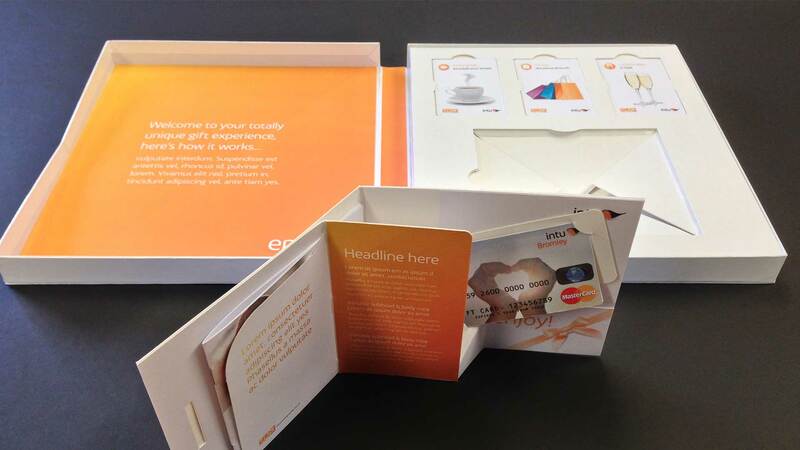 intu run a successful MasterCard gift card programme for their customers. The card is available to buy in all the shopping centres, and online, and comes with a gift card carrier and envelope in line with traditional gifting programmes. intu wanted to do more with their offer, yet still reflect their brand values of bringing joy and unexpected pleasure to the customer. The company approached Livewire to help develop a concept for their gift card proposition turning it more into a customer experience, yet maintain the concept of giving. Specifically, the task was to put the existing MasterCard gift card at the heart of the proposition and create a range of products that would appeal to their customers looking for a great gift idea. As part of the proposition development process, intu asked Livewire to work on naming convention, brand creative and a unique method of presentation packaging that would create a new and exciting retail proposition to further build their gift card programme. Materials were produced for a pilot designed to test the concept. By using intu’s customer data and insight, along with gaining a good level of understanding of the intu brand and values, Livewire worked closely with the Customer Experience team to develop a range of appealing gift experience packs. To complement the gift card, a range of offers were developed to provide customers with exclusive deals, benefits and a memorable shopping experience that would only be available through these products. Working closely with the brand guidelines, the Livewire creative team developed a complete gift-packaged proposition that would be something the recipient would want to keep after their experience. The creative and packaging development combined clever cardboard engineering and use of the intu brand to deliver an enjoyable customer experience. Livewire successfully brought the concept to life by developing a physical prototype designed to engage with internal stakeholders.